If you've had your dog ever since it was a puppy, it's easy to tell how old your dog is by using his birthdate. But for the many people who adopt older dogs from a shelter, their dog's true age can be a real mystery. Fortunately, there are several ways to calculate how old a dog is in both dog years and human years. The most common way to determine a dog's age is through his or her teeth. You can't tell a dog's exact age, but examining the teeth can give you an approximate idea of your dog's age range. When a dog is a puppy, their deciduous teeth (baby teeth) are fully formed by about eight weeks of age. Their permanent teeth come in by about five to six months of age. A dog in good health at age one year should have clean, healthy-looking teeth. As the dog grows older, tartar will form as well as cracks, ridges, and wear from normal use. A senior dog, even with good dental care, is likely to show a lot of wear on the teeth and tartar as well as possibly missing teeth and dental disease. An older dog may also have bad breath. Keep in mind that how accurate this method is when it comes to calculating how old a dog is will vary depending on the shape of your dog's teeth. A dog that has had regular dental care and cleaning will obviously have better teeth than a dog that has had little veterinary care. As a result, two dogs of the same age with different levels of dental care during their lives may be aged somewhat differently because the quality of their teeth is not the same. Another way to tell that a dog is a puppy is their overall body structure and skin. Puppies, particularly from medium and large breeds, are known for having large, awkward paws that seem to belong to a larger dog. They also will have loose skin and will move in an awkward, slightly clumsy and exuberant manner until they reach one to two years of age. To determine "middle age" for a dog, consider the median point for a dog's lifespan. For example, a small breed dog with an expected lifespan of 14 would be middle-aged at seven years of age. A medium size breed expected to live 10 years would be considered middle-age at five years old. Many dogs will develop a "cloudy" appearance to their eyes as they get older. Senior dogs also often have eye conditions related to cataracts and vision loss. They may also have red eyes. As dogs get older, they develop white and grey hairs just as humans do. These tend to first appear around the dog's snout, whiskers, and eyebrow regions. The older a dog is the more white hairs they will display and in more areas of the body. This method is not as useful with a naturally white dog, however. Also, some dogs may never show grey hair. It's difficult to pinpoint an age at which a dog's hair goes grey, but usually you can see graying on the muzzle around 7 to 8 years of age. This is the average for a medium-to-large sized dog, with greying happening 1-2 years earlier for a giant breed and 1-2 years later for a smaller breed. However, dogs that have experienced stressful lives may exhibit grey hair much earlier. Older dogs may also show hair loss. Middle-aged and senior dogs often have lumps on their skin that are benign fatty masses known as lipomas. A dog that has one or more of these is probably an older dog. Lipomas can develop in dogs of any age, but in general dogs begin to develop them around six years old. As a dog matures, his behavior will change. A middle-aged dog will not likely have the bouncy exuberance of a puppy. Senior dogs may show more confusion, known as Canine Cognitive Dysfunction (CCD) and decreased activity levels with accompanying weight gain. 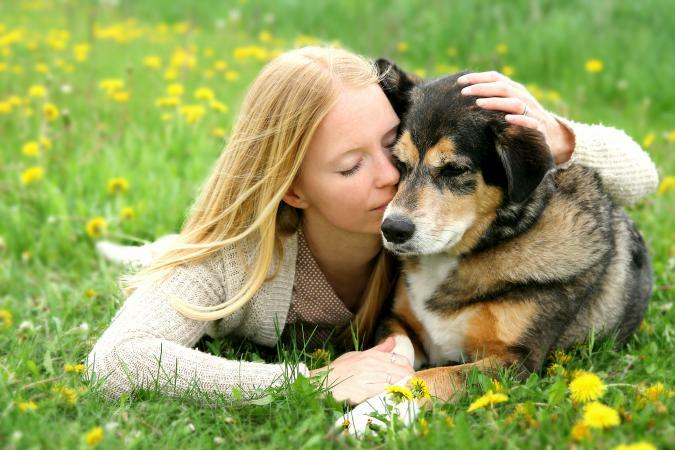 Research has found about a third of dogs with CCD develop the symptoms at 11 to 12 years of age, and almost 70 percent at 15 to 16 years of age. They may also have more house training accidents. These are not behaviors exclusive to older dogs, but they can indicate your dog is closer to a middle to senior age range. There are many dog diseases that tend to appear among middle-aged and senior dogs. Some of these conditions include cancer, heart disease, arthritis, and kidney disease. A young dog can develop any of these conditions, but it's very unlikely compared to the incidence in older dogs. For example, small breed dogs tend to develop heart disease at five years of age or older. Most dogs who become diabetic do so around five years of age or more. Age ranges will vary for each condition, but knowing what your dog is suffering from can give you a clue of what their age range is. An older dog will develop changes in their daily routine, including eating and drinking more or less and changes in the frequency of urination. These changes can indicate your dog is suffering from urinary incontinence as well as possibly more serious diseases that affect older pets. According to VetStreet, when your dog has reached the last quarter of his estimated life expectancy, you can consider him a senior and expect to see these types of daily changes. Sometimes pet owners might not notice subtle changes in their dogs. Taking photos regularly to compare physical changes can be helpful in deciphering your pet's approximate age. How Long Is a Dog Year? If you want to figure out your dog's age in human years, the calculation is based on the size of your dog, as well as his age. Dogs mature faster than we do and smaller breeds have longer life spans than large and giant breeds. This chart can give you a general idea of your dog's age in human years. If you want to know how old is 1 in dog years, that would be 15 human years, regardless of dog size. A dog that is two years old is 21 in human years for all sizes of dogs. After age two, human age equivalents begin to diverge. For three years and older, add four years if a small dog, five if a medium and six if a large dog. For example, if you're wondering "how old is my dog if he is 7 years old?" a small breed dog would be 41 (21 human years at age two, plus four years times five for the additional five years of age.) A medium size dog would be 42 and a large size dog would be 43. If you want to know how old is 18 in dog years, a small dog would be 85, a medium dog would be 101 and a large dog would be 117. You can also use a dog age calculator which will give you the age based on your specific breed. Without a verified background history on a dog, it's not possible for a veterinarian to pinpoint an exact age for your canine friend. A veterinarian can, however, give your dog a thorough medical check-up and provide an informed medical opinion on your dog's most likely range of age. Your veterinarian can also help you understand how to care for your dog's needs based on his or her approximate age range. Your veterinarian can also help you if you're wondering how to tell the age of a cat or any other pets you may have.